And here's one now.......Dwight Kalb paints another one at The Parrot Actually, it's Dwight Kalb, who painted the night-time portrait of the bar pictured above, doing a daytime indoor portrait of our gin mill. And though I really wouldn't call him shady, I will say he says he is, in the words of Key West writer Joy Williams, one of our "engagingly louche clientele". A Key West landmark since 1890, the Parrot is the first and last bar on U.S.1. Home of great drinks and bad art, pool, darts, and pinball. It's a one-of-a-kind open-air tropical saloon with spine-tingling cocktails, friendly bartenders, and ice-cold beers. The Parrot's Happy Hour is featured from 4 - 7pm, 365 days a year. Our World-Famous JukeboxThe Juke Box is legendary. Mostly blues - Chicago, Memphis, Texas or Delta. Lately an infusion of New Orleans funk: Papa Gros Funk, or Eric Lindell, The Radiators. Throw in a home-made cd featuring Robert Randolph and the Family Band, Galactic, and North Mississippi All Stars. Whenever we run a scan to see who's playing what on the box, Jimi Hendrix...James Brown...The Rolling Stones are right up there but but the rest of what they're playing includes MOFRO, Tommy Castro, Willie Dixon, Delbert McClinton, Tinsley Ellis and more. Billy Bacon and the Forbidden PigsVisiting bands pore over our juke box. (Billy Bacon, while mining our juke box, found Elvis Costello covering a George Jones song on his two-cd set and was knocked out.) A new and improved feature of the site allows you to review the jukebox lineup right here! There's always live music on the weekends, and many weeknights. Ask around town and you'll find the Parrot is hailed as providing the very best in musical entertainment. The schedule is eclectic, but that shouldn't surprise anyone. Musicians love our audiences as much as the crowd digs the band. In February it was three night with the legendary midwest blues band Lamont Cranston, and a memorable one night stand with the Southern-fried funk of Papa Mali. Rockin' JakeUp on our stage could be who's hot around town, or a national touring act. When Billy Bacon and Big Sandy did consecutive Sundays Pat said we should just turn the place into a honky tonk. We wound up the year with a flurry of female blues performers that included Kelly Richey, Joanna Connor, Candye Kane and Ana Popovic. Papa Gros Funk and Rockin' Jake brought in the New Orleans Funk for Christmas and New Years. 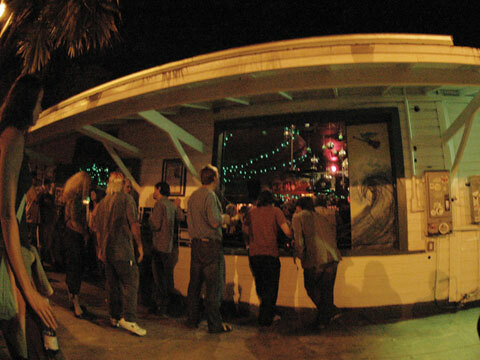 And take heart: There's NEVER a cover charge at The Green Parrot....Remember: No Cover No Minimum No Wonder The Green Parrot Bar: Your Southernmost Center for Culture. Maybe it's not for the cultural elite, but it's certainly for the culturally deprived. Just a short crawl off Duval on the corner of Southard and Whitehead.